Approximately 200,000 people walk through the fair every day and access the cellular data network. These white blocks are some of the 56 antennae located across the fairgrounds that route signals through coaxial cable and fiber optic cable. Each antenna accepts a signal and routes it through coaxial cable to a Remote Terminal Unit (RTU) on the fairgrounds. Installers run Superior Essex coaxial cable as part of the Distributed Antenna System (DAS). Superior Essex manufactured the coaxial cable used for the field-installed antennas. The Grandstand proved to be a harsh installation environment, but the coax cable was effortless to pull and maneuver throughout the structure. The Superior Essex coaxial cable also passed all initial-install and post-install standards tests. The cable management rack solution from Ortronics is an easy-to-install, feature-rich server rack solution, which is quick to source and accessorize. The Grandstand is made of iron, concrete, thousands of seats, and has a capacity for up to 17,000 people. Such a structure is not an ideal environment for cellular data service. The Minnesota State Fair is the 2nd largest state fair in the United States, attracting nearly 1.8 million visitors each year. The 12-day festival is an annual highlight on a typical Minnesotan’s social calendar. The grounds of the Minnesota State Fair span 320 acres and feature many historically significant buildings. Each year, food, animals, artists, and top musical acts from around the world attract people to “The Great Minnesota Get Together”. The Grandstand is made of iron, concrete, thousands of seats, and has a capacity for up to 17,000 people. Such a structure is not an ideal environment for cellular data service. Photo courtesy of mnstatefair.org. With an average annual attendance of nearly 2 million people, the Minnesota State Fair produces an extremely large mobile data challenge. Fairgoers routinely share their fair experience via social media and text messages. The State Fair Grandstand, built in 1909, hosts many of the fair’s marquee events and musical acts. The Grandstand is made of iron, concrete, thousands of seats, and has a capacity for up to 17,000 people. Such a structure is not an ideal environment for cellular data service. 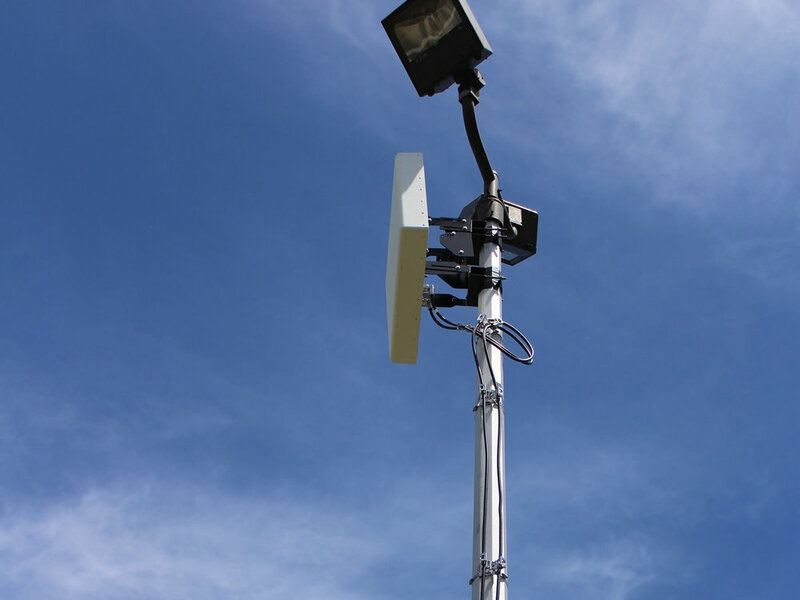 While the grounds were equipped with existing data coverage from macro antennas, the existing system was not designed not support the cellular data demands of hundreds of thousands of people that flock to the Minnesota State Fair Midway each August. It was data capacity, not data coverage, which was the main issue for State Fair organizers. During non-peak times in early summer, data coverage and data service are excellent. However, when 200,000 devices attempt to access the same signal during peak times during the 12-day fair, user frustration builds due to weak data signals. Local carriers are unable to support these demands through their macro network. In addition to consumer data access, all public safety radio systems used at the fair rely on the State Fair’s data infrastructure. Minnesota State Fair fire, EMT, and police departments all rely on the system if an emergency arises. With the quantity of devices growing exponentially, coupled with the continuous usage of data on those devices, Minnesota State Fair leadership identified they needed a solution to their data problem. DataStrait Networks is recognized as the Upper Midwest leader in voice, data, and security infrastructure. By establishing a working alliance between manufacturers, engineers, architects, and contractors, DataStrait has a long history of providing the products, services, expertise, and creativity necessary for constructing a reliable, high performance, communications network infrastructure in a fast and cost-efficient manner. A Minnesota-based company, DataStrait’s portfolio includes state-of-the-art stadiums, Fortune 500 corporate campuses, government entities, educational institutions, nonprofit organizations, and small businesses. 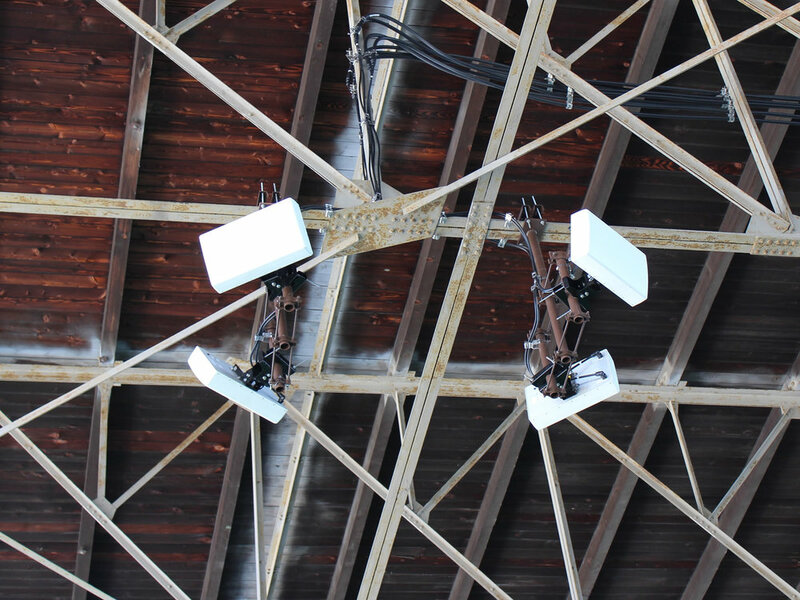 Distributed Antenna System perched above MN State Fair Grandstand seats. Coaxial cable installation beneath MN State Fair Grandstand seats. DataStrait Networks worked with fair organizers on a vision for a scalable data infrastructure solution that would meet the unique business needs of the Minnesota State Fair. Leveraging DataStrait’s network infrastructure project methodology, everything from materials selection to integration and training was addressed in an efficient step-by-step proven process. 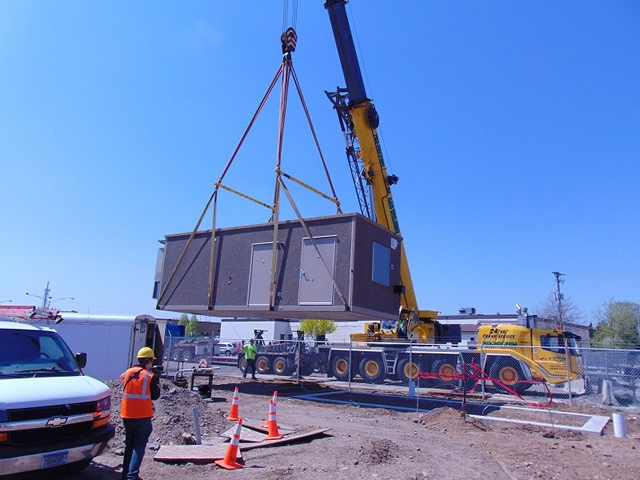 Partnering with MP Mobile Solutions, another Minnesota-based company that specializes in converged mobile infrastructure, DataStrait helped develop a data infrastructure solution for the Minnesota State Fairgrounds that exceeded the rigid technology standards of the telecommunications industry. With thousands of people and businesses demanding mobile data during the Minnesota State Fair, a distributed antenna system (DAS) made perfect sense to accommodate the data demands of fairgoers. To build the distributed antenna system’s headend, the control center where various signals are brought together and monitored before being introduced into the network, DataStrait recommended the ‘Mighty MO 20’. The flagship cable management rack solution from Ortronics is an easy to install, feature-rich server rack solution, which is quick to source and accessorize. 56 antennas within the Distributed Antenna System are located throughout the Minnesota State Fair's 320 acre campus. Fairgoers may see large white blocks perched inside and outside of buildings. These white blocks are some of the 56 antennae located across the fairgrounds. Each antenna accepts a signal and routes it through coaxial cable to a Remote Terminal Unit (RTU) on the fairgrounds. The RTU translates the signal and sends it through underground along fiber optic lines to the headend. Superior Essex manufactured the coaxial cable used for the field-installed antennas. Installation specialists from MP Mobile Solutions were impressed with the quality of the coaxial cable. The Grandstand proved to be a harsh installation environment, but the coax cable was effortless to pull and maneuver throughout the structure. The Superior Essex coaxial cable also passed all initial-install and post-install standards tests. The final deliverable was the Midwest’s 2nd largest telecommunications system, rivaled only by the telecommunications system at Ohio State University. When a fairgoer makes a call, sends a text message, or posts something on social media, the transmission is now picked up by one of the 56 antennas and sent through fiber optics to a data center near the fair. 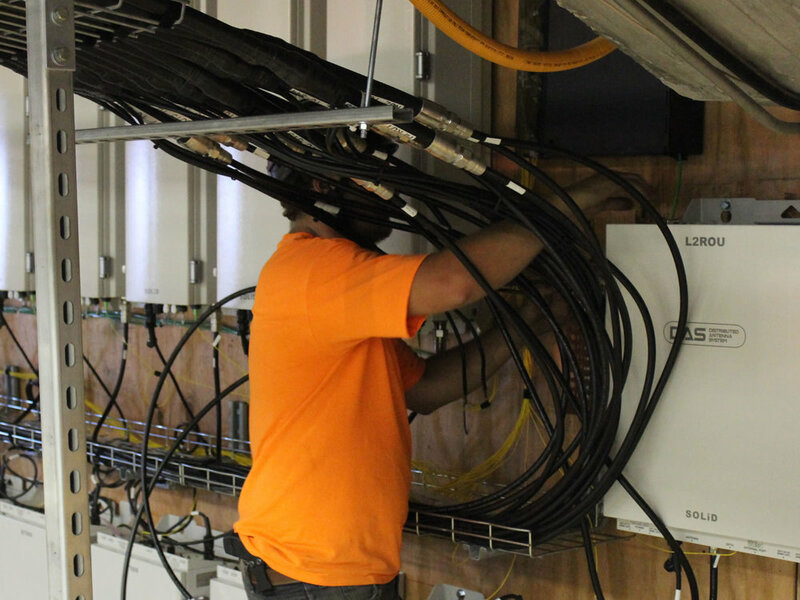 From the State Fair’s data center, the transmission is sent through coaxial cables to alternate data centers set up by mobile phone networks such as AT&T, Sprint, T-Mobile, and Verizon. 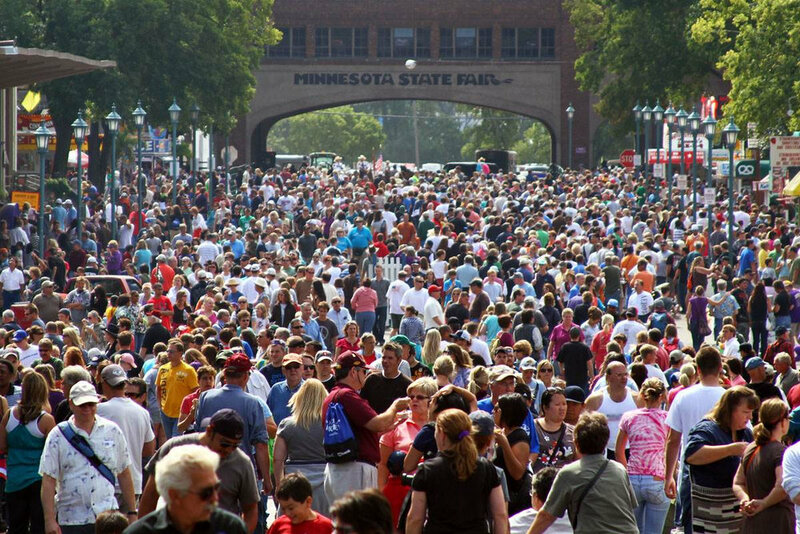 Nearly 118,000 people went through the Minnesota State Fair gates on day one, the second busiest opening day in history. The system is up-and-running seamlessly and the user experience has been positive.